Hoo boy, its been a tough time to be a Red mage. I think this is the first time in several years that you can look at tournament results both on Magic Online and in person and not see Mono Red decks cracking the top 8. The Standard format has become very homogenized by a handful of decks, and Born of the Gods did little to change that (in fact strengthened if anything). 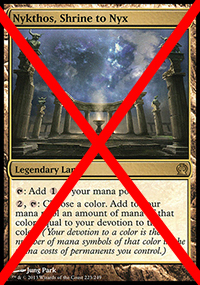 I’d like to say that you can keep banging away at a format like this with ideas until something sticks, but the brightest minds in Magic haven’t been able to break the mold, and the true creative types out there haven’t performed with their brews. Sometimes you just have to accept facts. Last Saturday I decided to play in a PTQ in Lindenhurst, IL. I wasn’t planning to originally but sometimes I can’t get away from the addiction of this game. I had been practicing with various brews of R/W Burn, most of which were similar to the ones in Patrick Sullivan’s last article on it (see HERE). I had also briefly playtested a modified Conley Woods RW Midrange build from an article he wrote a few months ago (see HERE). Both deck styles appealed immensely to me, and results from both were fairly positive online, but something was amiss. I tried subbing cards out here and there, yet it seemed like the issues were more matchup related rather than card selection. The R/W Burn lists appeared to have poor games against Mono Black Devotion and UW Control unless they ran maindeck Skullcrack, but doing so put the deck in a poorer position against any kind of aggro or tempo deck. 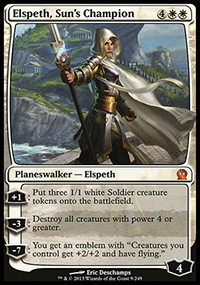 Elspeth was a feature card of Conley’s build, and I thought that might be a good direction to go given my success with Big Boros at the previous PTQ. Ultimately though, the list would have a variety of draws, similar to Big Boros, and I was really sick of playing decks that were inconsistent. One of the staple hallmark traits of Mono Red Aggro is that you know what you’re getting every game. Granted, most decks play differently, but in a format where you have a few choice outs to the big contending decks, and each of those outs differs based on matchup, you really have to draw them reliably. I wanted Chained to the Rocks against Mono Black, Mono Blue, and GR Monsters, but not against UW Control. I wanted Mizzium Mortars in the same fashion. There just didn’t seem to be a list that could you play a strong game against all the contenders. You were either giving up a matchup game 1 or you were weak against everybody. The Burn deck also felt rough because despite having an excellent land base (which I’ll expand upon later), it didn’t have any kind of permanency. This sometimes resulted in the deck running out of gas if your opponent played enough threats requiring your attention. This combination of cards is ridiculous, and if you think just off the top your head you can beat these cards, you better be able to prove it. 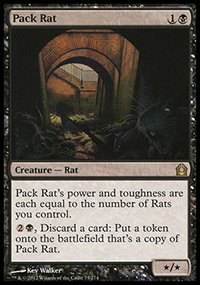 Taking the opponent’s best card or best removal spell and then playing Pack Rat is game over in so many situations. But I’m preaching to the choir, we all know how good this deck has been the last few months. 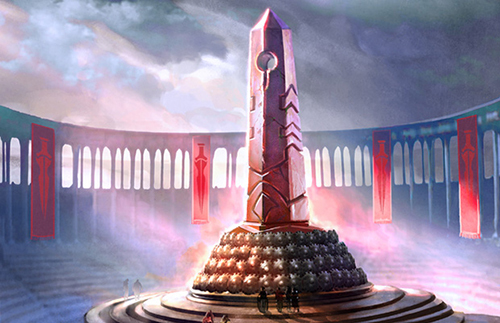 It intrigued me even back when Theros was still being spoiled, and it looks even better today. Bile Blight was a huge upgrade, along with Drown in Sorrow. They made the mirror match a lot more skill intensive, and the Mono Blue match very agreeable. I still think Mono Blue Devotion is a very strong deck, and it can beat Black still, but if you have to lean the matchup one way or another it’s definitely in favor of Black. On Saturday I played against five mirror matches, a GR Monsters deck, a Mono Blue Devotion deck, and a GW Aggro deck. Clearly, the memo had been sent and a lot of us were on the same line of thinking. My first two rounds went horribly, I hadn’t given the deck the amount of practice it really deserved and I made a series of giant misplays in several games that cost me each match. I’m talking about the really bad kind of misplays, like knowing your opponent has an Arbor Colossus in hand, and then proceeding to pitch Hero’s Downfall to your Pack Rat with a Desecration Demon on the board. Yeah. Real real bad. After the first two rounds I started to get more comfortable with the deck and rattled off three wins in a row. I then lost an incredibly close game three to a fellow Mono Black player where we essentially played off the top of the deck and he ended up drawing an Underworld Connections about twenty turns in. It’s crazy how important that card is to winning the mirror, it’s easily the best card in the matchup. In the next round I had to play one of my carmates, which was unfortunate, and I ended up winning but he made a misplay which helped me out. Finally in the last round I played against Mono Blue and despite drawing absolutely horrible hands including a mulligan to four, I stayed with her until being overwhelmed by an unanswered Master of Waves in game three. But it wasn’t fun. And it certainly wasn’t Red. In the next few days after the tournament, I started messing around with RW Devotion again. 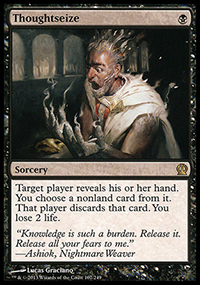 I really liked some of the powerful cards and sequences that deck could put together, but I was always disappointed with some of the terrible draws the deck could have. Nykthos, while being great for the nut-draws, was incredibly underwhelming when your initial hand was light on land. Furthermore, the deck always seemed to run out of steam if your initial wave of plays became exhausted. I wanted to fix this problem. After tooling around a bit, I found an interesting answer. While it didn’t shore up some of the bad matches, it made every one a little better across the board. It made the deck feel good, despite taking away just a smidge of explosiveness. Before you yell, let me explain. Nykthos, Shrine to Nyx can be nuts in the RW deck. The curve out of Ash Zealot or Frostburn Weird into Burning-Tree with a Nykthos out is a strong opener that most decks can’t deal with. Sometimes though, this hand does get dealt with, and this leaves the deck completely out of gas. Other times, Nykthos prevents you from playing your Boros Reckoner for an umpteenth number of turns or keeps you off critical four and five mana sequences. The results ultimately didn’t come last Tuesday, but the deck performed like an absolute champ and it gave me ideas for what to change. For starters, the mana was a godsend and my draws were all extremely powerful. The only real reason I didn’t end up doing well was because our Tuesday win-a-box is always full of great competition and my opponents drew equally well. If I had to play this again, after some basic modifications, I absolutely would. All of the little inconveniences that I used to have over this archetype disappeared. It felt like a new deck had been born. And when I say my opponents drew well, they drew VERY well. One game, my opponent (playing Jund) opened up with triple Abrupt Decay into Putrefy into Doom Blade into Reaper of the Wilds. Had he missed a single card of that sequence, he was pretty much dead. That’s how good this list is at firing back, it can even almost get there against stuff like what I just mentioned. So onto the problems. The first thing you might raise an eyebrow at in the list is the presence of Burning-Tree Emissary. With no Nykthos to fuel, he really is out of place in this list, but he does still give you the ability to either play a Mizzium Mortars on the same turn you play him or a higher curve spell. This ability I think is important enough that I still like him over Rakdos Shred-Freak or some other alternative. If you decide to try the list, feel free to play around with that spot and let me know if you discover something better. Next up on the problem sheet is the UW Control and GR Monsters matchups. The UW Control matchup is close, but it’s within a few cards of being better. 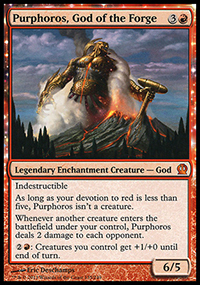 This was always a close matchup for RW Devotion, and the keys to it are Purphoros, his Hammer, removal of Detention Sphere, and combating Sphinx’s Revelation. The sideboard brings in Glare of Heresy, Revoke Existence, and Chandra, Pyromaster. All of these are great, but I think the deck wants another card or two to make a stronger case for beating it. 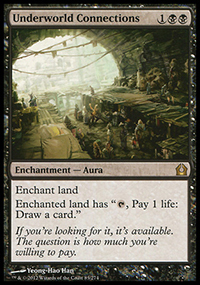 Whether that means cutting a Chain and Mortars in the main (which are fine as 4-ofs with all the scry) for another Purphoros and another Hammer, or putting Boros Charm in the board, it’s probably just a simple adjustment. I’d also like to run three Glare of Heresy and one Revoke Existence because Glare can deal with Elspeth and Archangel of Thune, and it’s good against the W/x Aggro decks. Assemble the Legion stays in the sideboard against UW, because they have Jace which nullifies the tokens and because it’s just too slow. I’ve rarely had a game where its been able to take over before they’ve found an answer. GR Monsters is the absolute worst matchup. It was never good before, but its become worse because of Xenagos, God of Revels and Flesh // Blood. Both of those cards make that deck even more powerful. I think if you’re playing a Red based deck, it’s probably where you want to be, but it does have weaknesses which I think are easier to exploit than RW Devotion. The problem is that Elvish Mystic gives them a little bit faster draws and their threats are usually bigger. You’re not a slouch however, and if you get a good opener you can just as easily overrun them. Boros Reckoner is also an all-star against GR, and it’s a tool that they don’t have at their disposal. Out of the sideboard, I tried out Celestial Flare as a quick answer, and it was easily a homerun. This format has countless number of decks that often just attack with one creature at a time, and between that fact and the fact that you have other removal, Flare almost always ends up just being straight Doom Blade. For the future, I would for sure run a third, possibly even a fourth if there was a way to find room. I want it against Mono Black as well, so there’s added value in that. Speaking of Mono Black, game 1 is very much in your favor. That’s one of the big strengths of this deck, and while game 2 can be nightmarish at times depending on their draws, you can combat it by bringing in removal for Lifebane Zombie and Nightveil Specter and relying on your scry lands to pull you out of heavy discard openers from their end. I’m not sure on the Mono Blue matchup yet because I haven’t had time to do a lot of testing, but you have four Chains and four Mortars maindeck, so that’s a big bonus over previous builds. Post-board you bring in Last Breaths, Angers, and some number of Revoke Existence and/or Chandra. Against any other fair deck in the format, you just steamroll. This deck can overrun almost everything I’ve come across, including hyper aggro most of the time. Once you start dropping Boros Reckoners into Purphoroses into Fanatics, there’s just not a whole lot a deck can do against you to catchup from giant 10-15 damage life swings. Post board you have Anger of the Gods, more spot removal, and Chandra, so you can usually shore up any inkling of an issue from game 1. But What About Mono Red Aggro? I know, I know. These decks are all expensive, and for many Mono Red players, budget was a reason for the choice. For me, I love playing Red because I like the playstyle, but budget is a real concern for everyone. I’d give the cop-out answer of “well if you’re on a budget just play white aggro” but that wouldn’t be staying true to my fiery brethren. If you’re going to play Mono Red Aggro (Red Deck Wins, Sligh, etc), I think you’re best option would be to pick between one of two routes. You could play a streamlined aggressive list like what Owen Turtenwald and Tom Ross championed earlier this year (HERE and HERE), or you could splash white for Chained to the Rocks to shore up difficult matchups such as what Longtoe and James Kerr did (HERE). A third option would be to go a little bigger and play more creatures with three, four, and five toughness. Since you’ll be favorable against most decks aside from Mono Blue, the real trick is to be more resistant to Drown in Sorrow and Anger of the Gods. Possibly trying stuff out like Felhide Spiritbinder, Ember Swallower, etc, or just packing the three-drop threat density to an all-time high. The aggressive route is probably the preferred one though at this time, and I would suggest having a transformational sideboard where you “go big”. Something along the lines of adding two lands to bring your count up to 23-24 and having stuff like Stormbreath Dragon and Anger of the Gods of your own. This will throw off your opponent’s game plan that they had for game 2 and 3 where they thought they would just be able to pick off your one drops only to find out that you’re not playing any anymore. 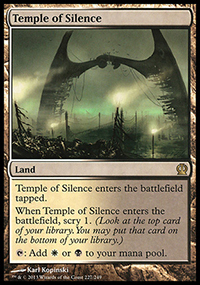 Like any Commander deck there’s a million different directions you can go with this. This is just simply my “time capsule” where it stands at the moment and I like it. There’s a handful of cards I’m wanting to add to it and I’d love to hear reader suggestions on it too. The last thing I’d like to talk about is future content. I’ve been promising videos for a while, but have run into roadblocks on my end with time and setup. I’ve recorded some of my playtesting sessions on Cockatrice and occasionally have been streaming, but haven’t put them on the website. For the particular WordPress setup that I have, you have to pay for an additional video plugin if you want the content directly on the site, otherwise I’d have to load them onto Youtube or a similar service. I’m fine with doing the latter, it’s just time consuming and unfortunately I work a lot and have a million pressing obligations in my free time. It’s not a lost hope though, I’m going to get it together at some point soon and get it up, so keep staying tuned. As for my streaming, I’ve been having trouble getting Xsplit to recognize my default microphone (I use a Plantronics headset and it works for every other program). Does anyone out there know of a better solution? I just got a suggestion from a friend that I’m going to try, but I figure enough folks read this site by now that there might be an even better option. Streaming otherwise has been fine, it’s just been sporadic, so I’m trying to work on setting up some specific time slots so you all can join in on the fun easier. If you haven’t done so already, please feel free to add me on twitter and facebook (RedDeckWinning for both). Thank you so much for the outpouring of support I’ve received in the last few months, I really really appreciate it. If I haven’t returned an email or message I promise I’ll do my best to get back to you, its been great to hear from folks and it gives me the drive to want to keep working on this site and watch it grow.